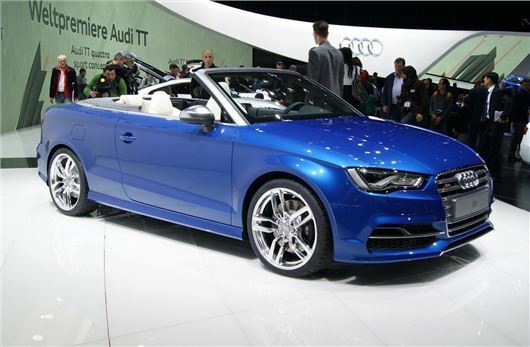 The Audi S3 Cabriolet has premiered at the Geneva Motor Show. It's powered by the same 2.0-litre TFSI petrol engine in the S3 hatch, developing 300PS and 380Nm for a 0-62mph time of 5.4 seconds, CO2 output of 165g/km, and official fuel economy of 39.8mpg. An S Tronic six-speed dual-clutch transmission is offered as standard, linked to quattro all-wheel drive. As with other high performance Audi models there is a drive select function, which lets the driver tweak steering feel and throttle response depending on driving conditions. Setting the S3 Cabriolet apart from the A3 Cabriolet are satin chrome exterior details, along with a subtly more aggressive bumper and grille plus quad tailpipes. As with the A3 Cabriolet the roof folds up or down in 18 seconds at speeds up to 31mph. Inside, the cabin is trimmed entirely in black, with matt aluminium trim details and metallic grey instruments. Sports seats are fitted, trimmed in leather as standard or an Alcantara and leather combination as an option. Standard equipment includes heated seats and xenon headlights. Order books will open in April, with prices expected to start at just shy of £40,000 and the first deliveries are due in July.